To celebrate my last hand-in for university, my boyfriend took me to the newly opened Edinburgh Brewdog Bar. Luckily I know the general manager and she lovingly recommended Choklat Stout by the Southern Tier Brewing Company and can I say, well done Southern Tier, well done. When describing this Choklat Stout, Southern Tier refers to the sacred book of Maya, which mentions a mystical beverage known as xocoati or ch-co-atle. It is thought that liquid chocolate was worthy enough to be drank by gods and goddesses. Today, chocolate is still thought of as a luxurious indulgence and what better way to celebrate its wonderful flavour than by putting it in an alcoholic beverage! Southern Tier have created a drink that will ‘tempt your senses & renew the power & interrelation of history in every bottle.’ Let me tell you, it did the job. The stout comes in a larger bottle than usual, an almost wine-like bottle which happily fills two serving glasses like the two in the picture above. The American brewing company Southern Tier has very modern branding and labeling, using bold fonts and simplistic features. The label is decorated with four pieces of chocolate, emphasising this predominant flavour. The label includes serving suggestions and tasting notes which I’m not sure are relevant and I don’t like being told what I should taste but nevermind. The label also provides a explanation of what exactly is in this beer. 2-row barley, caramel 60 malt, barley flakes, chocolate malt, bittersweet Belgium chocolate and kettle hops: chinook and willamette to be exact. It is very, very dark, almost black in colour and has a viscous swirl to its texture. I would describe it as a muddy chocolate colour. It does not pour much of a head but that might have something to do with the glass it is served in. It has an obviously distinct Belgian chocolate smell with notes of creamy latte-like coffee. The smell has some lovely layers to it and is sweet but bitter and strong yet light. 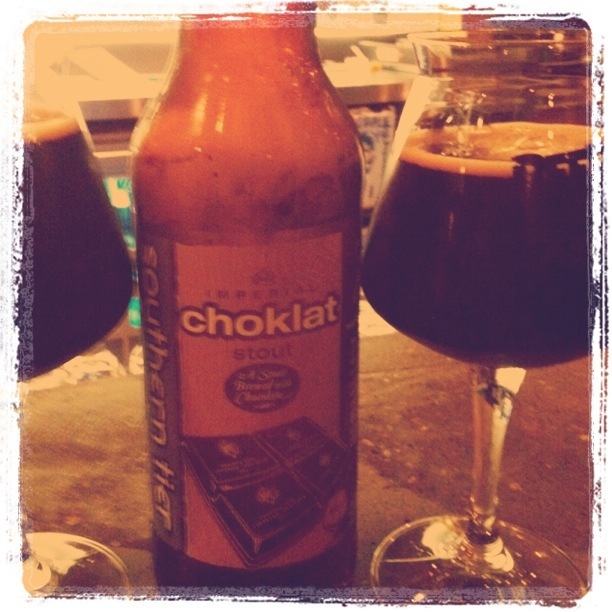 The sweet Stout smell is also apparent although the chocolate is an overpowering scent. Much like the smell, the taste of this beer comes in splendid layers. First is a bitter cocoa taste, like a dark chocolate bar with 80%+ cocoa, the beer is definitely a stout. This then softens into a lovely fluffy and sweet marshmellowy taste which coats the throat and pleases the tongue. After arrives that distinct Belgian chocolate taste, that came through so much in the smell and lingers on whilst sipping more. Lastly, the stout definitely hints towards a lambic style finish, ending again with a bitterness that balances out everything. After a full glass I must admit I am rather happy (hic) and would say I wouldn’t like to finish the bottle myself. However this lovely bubble of marshmallow, Belgium chocolate, cocoa and caramel is something not to be missed and without a doubt is a gorgeous and memorable choklat stout.